Titusville, FL - Police say a 74-year old Titusville woman was killed by her two family dogs. The woman suffered a dislocated shoulder and too many bite injuries on her body to count. "This poor woman endured a vicious attack," Lt. Todd Hutchinson, a Titusville police spokesman, said. Police think Lorraine May was breaking up a fight between the dogs. The dogs, which she had owned since puppies, had a history of fighting with each other, and were reportedly mother and son. Police theorize that May was breaking up a fight between the dogs, who, according to a relative, are mother and son. The animals, which May had owned since they were puppies, had a history of fighting with each other, Hutchinson said. The relative said the 11-year-old female golden-retriever mix is named Sammy, and the 6-year-old male Australian-shepherd mix is called Seth. 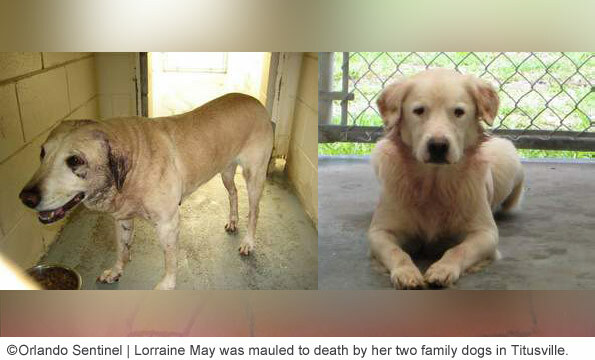 Autopsy results showed that May died of multiple "blunt-force trauma" caused by the dogs. According to a relative, an 11-year old female golden-retriever mix named Sammy, and a 6-year old male Australian-shepherd mix named Seth were involved in the attack. Both dogs were taken into custody and are being held in separate cages at Brevard County Animal Services while the investigation continues. Animal Services had received no prior complaints about the animals.